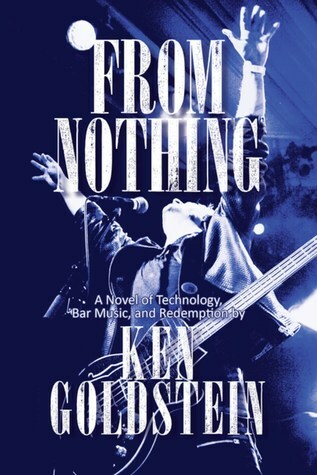 From Nothing: A Novel of Technology, Bar Music and Redemption. Ken Goldstein. Story Plant. Copyright May 2018. pb. 352 pp. ; ISBN: 9781611882544. Victor Selo’s life has bombed out and recovered twice. After the first time when he’s at rock bottom, he turns to playing lead and support guitar in bar bands. It’s popular music, especially “oldies but goodies” that most baby boomers loved and still love. Now after multiple years working in the tech business in Silicon Valley, in which he and his buddies devise a way to create apps for people to buy individual song hits. Technology develops so rapidly that he knows the company has to expand and move up several notches to stay on top of the music tech game. Rapidly he realizes that due to the narrow-minded attitudes and thinking of the “bosses,” the company is about to go bust. Victor Selo, however, has a great deal of anger built up inside and when his bosses are unresponsive to his suggestions and he discovers a competitor wants to buy them out just to destroy them, all hell breaks loose. After a totally engaged, violent scene, Victor Selo is fired. Not only is he canned but several days later he is “taught a lesson” with a brutal beating that almost kills him. He plans to run away but instead follows his gut. Returning to the job of guitar performer in a cover band, Vic meets several band members with sensitive and controlling ideas of how to climb the ladder to success. The lead singer who owns the group also sings an Elvis “wedding” gig in Los Angeles and a female singer who has some very creative ideas is stifled until Vic comes alone. The conflict continues until finally Vic, who seems destined to lead wherever he is, gets them to a critical breaking point where they must change or separate. At the same time, the opponents from his earlier techie life keep appearing making him unbelievable, flush offers of which he wants no part. The end is sheer stunning fiction. From Nothing… will remain in your mind long after you’re done reading. It’s got great ideas, mind-blowing tension, and adventure in every scene. It also contains music lyrics from an amazing playlist almost everyone up to the 21st Century can appreciate and rock along with. Some people are born leaders and Victor Selo is a fine heroic character who never falters in leading other men and women upward and onward! Nice job, Ken Goldstein!